In large skillet, cook potatoes and onion in oil over medium high heat 5 minutes or until golden brown and almost tender. Add bell pepper and zucchini; cook 5 minutes longer or until tender. 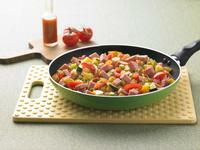 Add turkey ham and tomato to skillet. Sprinkle with cheese. Cover and cook 3 to 5 minutes or until cheese is melted.